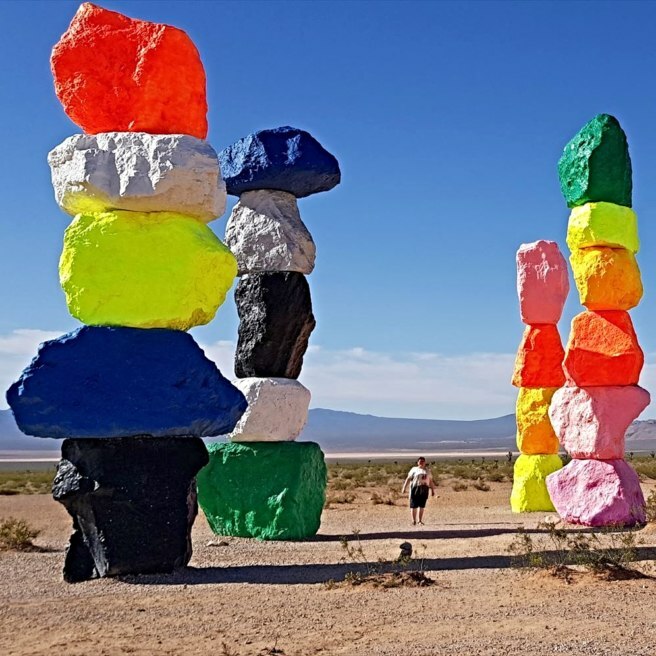 About twenty minutes southwest of Las Vegas, Nevada, just off the Interstate 15, you’ll see something extremely unusual, even for “Sin City”. No, it’s not a fancy casino, an ostentatious neon sign, or even the ghost of Elvis. 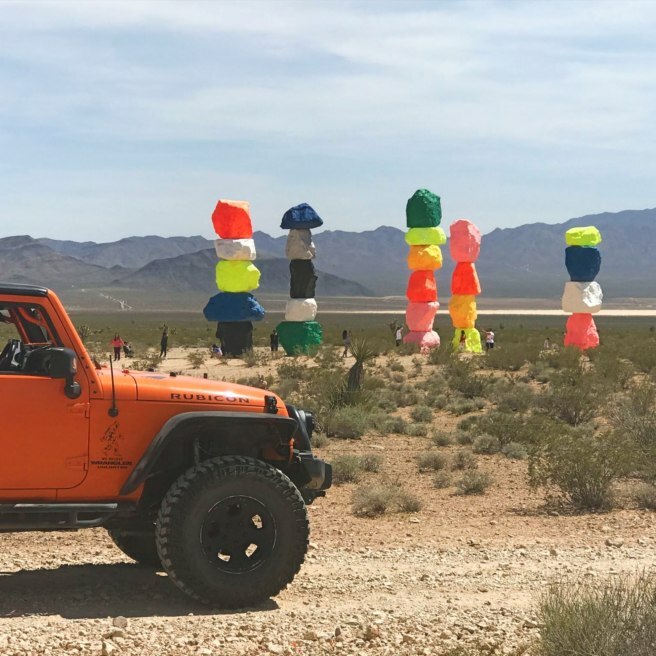 What appears to be a mirage is real: seven towers, each about 30 feet tall, assembled from enormous boulders stacked on top of one another and painted in contrasting fluorescent colors. And, of course, there’s a geocache there. 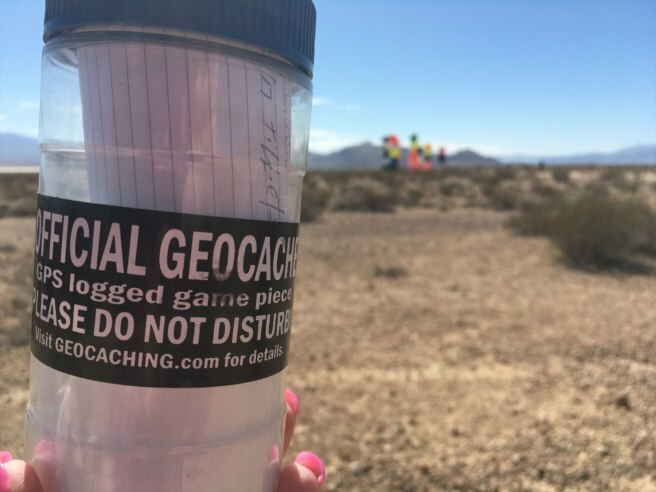 One of the most gratifying elements of geocaching is finding caches in places that you may not normally discover. Sometimes this is an amazing view or a creative cache, and, sometimes, it’s a strange location. The container has changed since this photo was taken—no spoilers here! 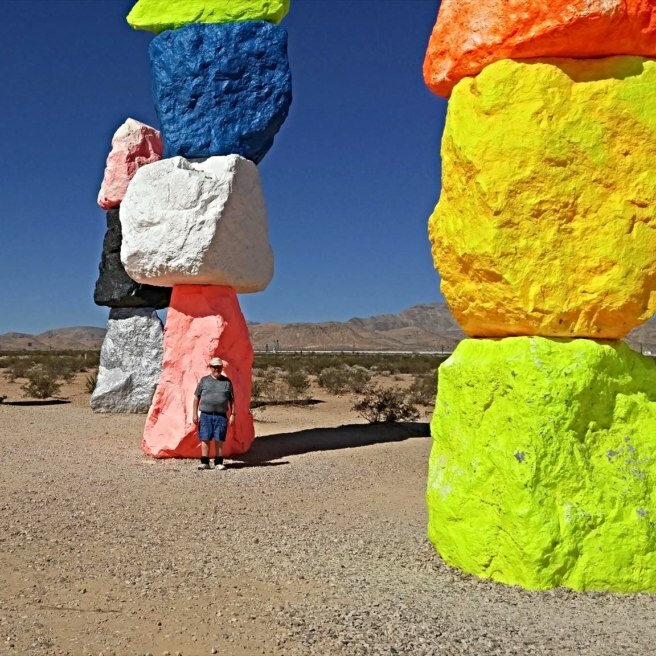 Traditional Cache “Stonehenge in the Desert” was hidden on May 4, 2016, coinciding with a public reveal of the art installation “Seven Magic Mountains”. The container was originally hidden closer to the structure but the cache owner moved to be amongst the brush, further away from the crowds. 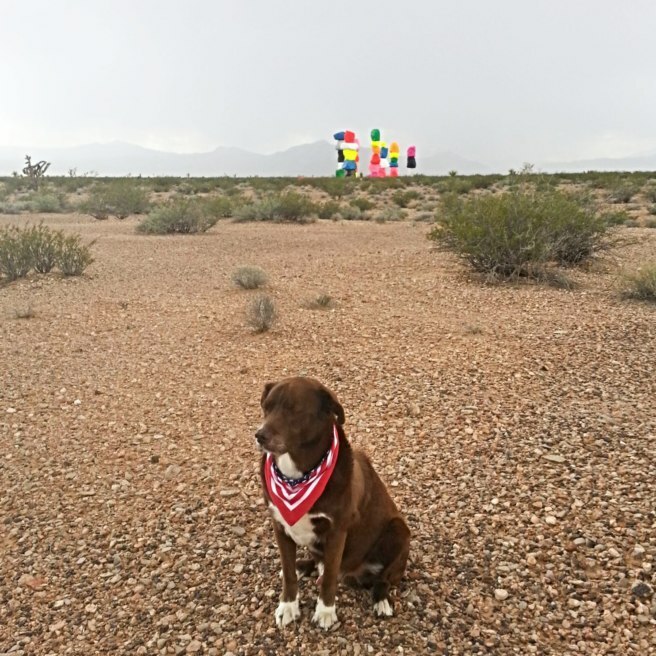 The desert is already a bizarre and mysterious place with plenty of lore about alien abductions and unusual stories. These towers make this spot seem like something from literally, out of this world. And the boulders are quite large (as boulders tend to be) and make for some cool Instagram or photo opportunities! Heading to the cache? Plan accordingly! If you head to this cache, plan accordingly. There are no restrooms, no convenience stores, no souvenir stands, and no bar. And geocachers, make sure to bring a pen. 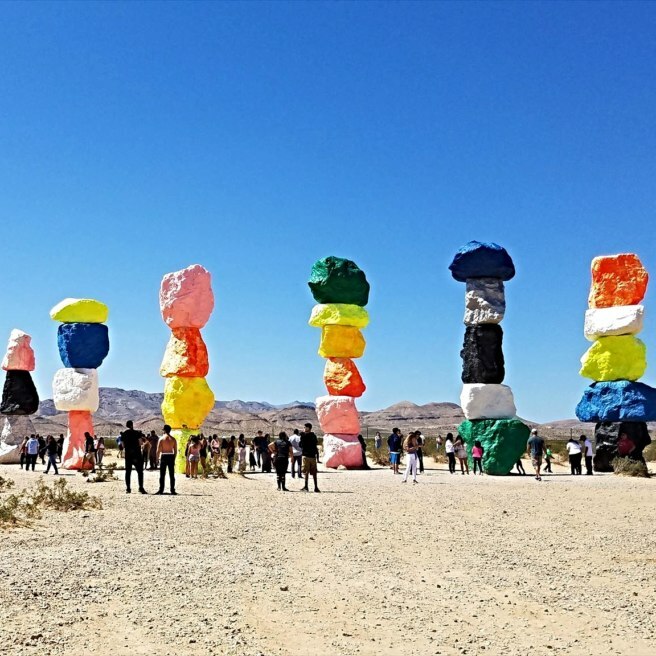 The exhibit opened on May 11, 2016, and was only intended to be on view for two years, but the artist and producers are working to allow the installation to stay for several more years, or at least through the end of 2018. 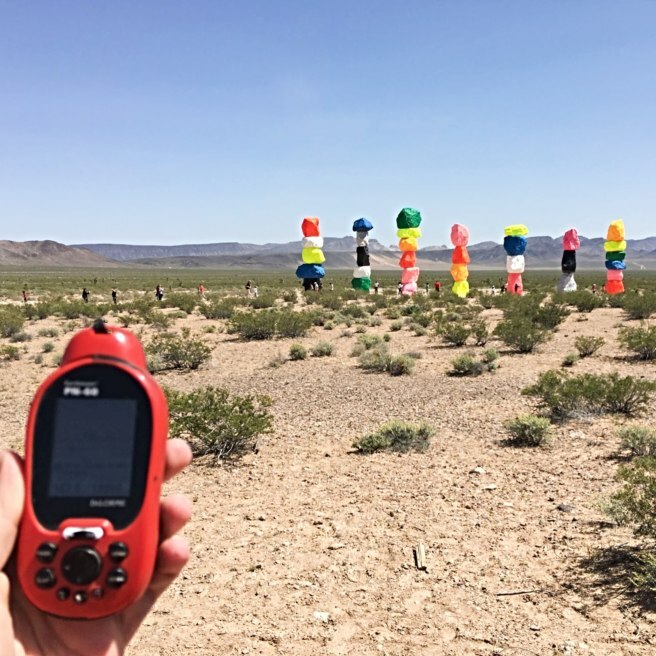 Where is the most bizarre location you’ve found a geocache?